Sunday July 5th 1925 Hattie to S S and church. I visited with Birdie. We took her to train in afternoon and had a short ride. Slept awhile after that and read in the evening. Monday July 6th 1925 I was home all day. Worked on bead bag. Hattie to town in AM. There was a hard rain late in PM. I had a letter from Nellie. Read in evening. Tuesday July 7th 1925 I was working on bead bag some. Hattie and I both down town in AM. I was at Dr Stewarts and later selected a hat. Hatti over to Fannies in PM. Did not come home till bed-time. I wrote Mrs Lowe and sent her bead bag. Letter from Mattie Stitt. Wednesday July 8th 1925 Very warm. I was home all day. Knit on bag. The girls went to a party in PM at The Hutchinsons. In the evening Hattie & I called on Louise Cottrell and her Aunt. Later her Uncle William called here. 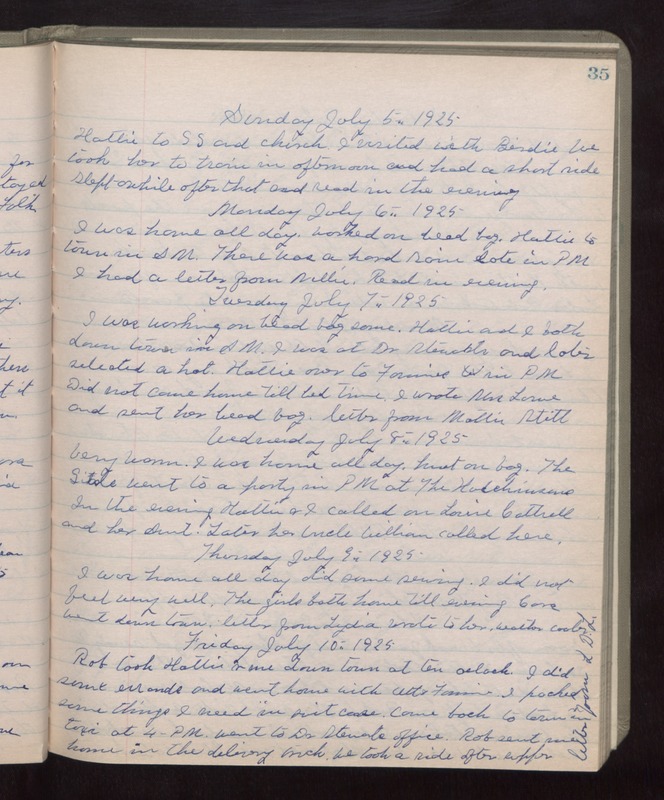 Thursday July 9th 1925 I was home all day, did some sewing. I did not feel very well. The girls both home till evening. Cora went down town. Letter from Lydia. Wrote to her. weather cooler. Friday July 10th 1925 Rob took Hattie & me down town at ten oclock. I did some errands and went home with Ott & Fannie. I packed some things I need in suit case. Came back to town in taxi at 4 PM. Went to Dr Stewarts office. Rob sent me home in the delivery truck. We took a ride after supper. Letter from L D L.